Badavilinga Temple is a wonderful temple in Hampi dedicated to Lord Shiva. The Hindu deity Shiva is worshipped in the form of a Linga in this temple. The Badavilinga temple is located near the Lakshmi Narasimha Temple. Tourists as well as devotees flock to the temple throughout the year. The Badavilinga Temple in Hampi has the largest monolithic Shiva Linga in Hampi. The Shiva Linga has a three eye mark drawn on it in line carving. The three eye mark depicts the three eyes of Lord Shiva. The beautiful Linga is made of black stone. It has a height of 3 meters. It is believed that the temple has been in existence since the period of the Vijayanagara Empire. Devotees come here from far and near to worship the Shiva Linga. The name Badavilinga is a combination of two words – Badva and Linga. In the local language Badva means poor and Linga represents Shiva. Legend has it that the Shiva Linga placed inside the temple was commissioned by a poverty-stricken peasant woman. Hence the temple came to be known as Badavilinga Temple. 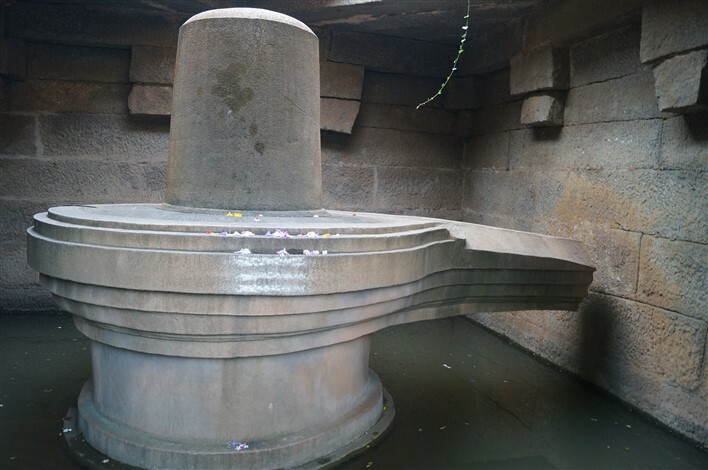 The huge Shiva Linga of the Badavilinga Temple is situated inside a small stone chamber. There is a single opening in front of the chamber through which devotees can get in. An interesting thing to note about the design of the stone chamber is that it has no ceiling. During the day time, sunlight enters through the opening in the ceiling and floods the Shiva Linga with light. The Shiva Linga has a large pedestal that is circular in shape. It is the yone pitha of the Shiva Linga. This circular pedestal draws into an outlet, also known as pranala. The pedestal of the Shiva Linga stands on a bed of water. This is due to the fact that the shrine always remains filled with water as a water channel flows through it. According to devotees, the base of the Shiva Lingam is submerged in water as it depicts the arrival of the holy river Ganges on earth and its flow is controlled by Lord Shiva. The Badavilinga Temple is a shrine that has not escaped the destruction that had befallen Hampi several centuries ago. However, the good part is that the Shiva Linga stands intact even today. The inner walls of the shrine, surrounding the Shiva Linga, have also escaped any severe damage. Though the temple is a small and simple structure, it is a fascinating place to visit and have a look at the large Shiva Linga. Hampi is a renowned tourist destination. There are several ways to reach Hampi from various parts of Karnataka and beyond. Once a visitor reaches Hampi, he or she can arrive at the Badavilinga Temple without much difficulty as it is easily accessible. Hampi is a ruined village that does not have an airport of its own. Ballari (Bellary) is the closest town that has an airport. Ballary is located at a distance of around 64 km from Hampi. Visitors can reach Ballari by taking a flight o the small town and then travel to Hampi by means of local transport. Hampi does not have a railway station. The nearest railway station is situated in the city of Hosapete (Hospet) that has the Hospet Junction Railway Station. Hosapete stands at a distance of around 10 km from Hampi. One of the easiest ways to reach Hampi from Hosapete is to take a bus. A few means of local transport also exists and visitors can avail them to reach Hampi from Hosapete. Hampi has a good road network and is well-connected to many towns and cities with the help of this network. Several KSRTC buses travel between Hampi and other towns and cities in Karnataka. Visitors have the option to reach Hampi by bus or by hiring private cars, cabs or other vehicles from the major cities like Bengaluru (Bangalore) or Mysuru (Mysore).